If your gift budget is under $297,000, then your gift ideas are based upon a state of poverty, whether you are thinkin on a birthday gift, wedding gift, baby gift, day gift, or any other gift or present. If that is your budget, then your gift basket ought to include The Holy Bible, King James authorized 1611 version. If you are in such poverty, that you cannot budget over $297,000 for christmas gifts for men, gifts for dad, or any other gifts for him, then it is because God has not awarded you prosperity, and that is truly likely to be because you have not studied his laws in the Bible. The male is, or eventually will be, the head priest of his family. the formula for prosperity -- obedience to the laws in the Bible. Click now on the image, at your left, to bring prosperity to your family! 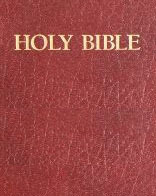 Order your special gift of The Holy Bible, King James authorized version. This offer is one of the most unique gift ideas. You can use it as a birthday present, or as a christmas gift for men, or any other occasion, where a present would be expected. Or unexpected. It is certainly more unique than a gift basket. WHAT IS THE SPECIAL TYPE OF MAN THAT THIS OFFER IS A GIFT FOR? I am looking for a special type of man, of high morals, who enjoys deep study and learning. He is interested in the secrets of nature and natural laws, as well as in understanding everything. He likes to learn how to understand people. Now I'll tell to you a bit about what I have to offer to you, as a christmas, wedding, day, or birthday gift for him. The gift is -- knowledge, the result of a lifetime of research into the many branches of astrology, including love astrology, medical, business, psychology, feng shui, Chinese astrology, Vedic astrology, and numerology. Unlike any astrologer, whom I know of, I have managed to combine much of the information from those diverse fields into a coherent system. My notes and library, on the subject of astrology, go deeper than any that you are likely to find anywhere. What I am offering, is to teach everything that I know about astrology to one -- and only one -- person, before I die. This is a big dream of mine, to pass along everything that I have learned, but it must be to the right person. YOUR GIFT TO HIM WILL MAKE HIM AN AUTHORITY -- A MASTER ASTROLOGER! In addition to that, he will also learn how to unlock the mysteries of his own horoscope chart -- in less than 14 days!